Grandpa's Pride BBQ: The Red, White, and 'Q'. We call it 'Merica! The Red, White, and 'Q'. We call it 'Merica! So, yet again, here you are reading the thoughts of one of your fellow BBQ brethrin. No judgment. Soon and as a nation, we will be celebrating yet another year of the founding of our great nation and all that it is. Yes, we have the good, the bad, and the ugly. Anyone that has been to Wal-Mart can attest to that. I've seen so many people in pajamas there that I thought I had walked into a double-wide, slumber party. With that being said, it is also a time to reflect on the past year in our nation's history. We have a new president with his first full year in office, and it certainly hasn't been boring. We have also finished the World Food Contest with a new winner crowned; we have had a Jack winner; and we have had many, many other local contests with new and old winners. I know our area has seen a decrease in the number of contests, and I don't know if that is a national trend or not. Sadly, I suspect it is. 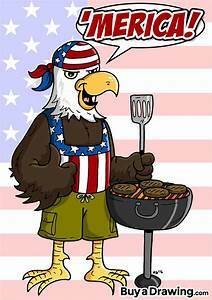 BBQ is a lot like our great nation. It is constantly evolving and changing. Much like underwear, change is a good thing. I do think the folks of our news channels and government could learn a lot about civility from paying attention to BBQ folks. The media is loaded with people just being plain ugly and rude to others. You don't see that a whole lot at a competition. Go to any BBQ competition, and anyone worth being around (minus the occasional idiot) will help you in any way and root for you when you win. Not that winning isn't fun (so I hear), but the BBQ folks always keep in perspective the fact that it is about community. I don't think BBQ folks will ever lose sight of that, at least I hope they don't. I know at one of our first contests in Dothan, I had someone volunteer to show us how to shave the fat off chicken thigh skins to get bite-through skin. Had a nice gentleman at the site next to me at my first KCBS contest show me how to build a good turn in box. Mr. Cook even gave me a guru thermometer cable when mine got torn to pieces during transport, and Forrest Dilmore gave me a blue hippo that he got out of one of those grab machines. Nice folks all the way around. You don't see that a whole lot on the news, and it's easy to forget that America is made up of real, hard-working, caring, and salt-of-the-earth people. I sincerely believe the folks in BBQ are more representative of the real Mr. and Mrs. America than what the some would have you believe. The talking heads and politicians? Meh.......not so much. Remember: Politics = poly (many) + tics (blood sucking insects). With that being said, I challenge you Mr. and Mrs. John Q. Public to get out there and say hello to your neighbor, be nice to that someone that is having a bad day, help that new team competing for the first time at a local BBQ contest, challenge the stereotype of others, and prove to the world that 'Merica is still a great place full of genuinely nice and caring people. If you happen to do it while wearing a pair of Sponge Bob pajama bottoms at a local Wal-Mart.....then so be it. Anyway, y'all take care and get out there and smoke some meat. Enjoy the day and remember all those that have served and keep on serving to keep our great nation what it is. Riley says "Hello" and "Hey man, is that Freedom Rock? Well turn it up!"